The results of our annual survey are in, and our readers know what they like – the top five neighbourhoods remain unchanged from last year, though there’s a new No. 1 in town. 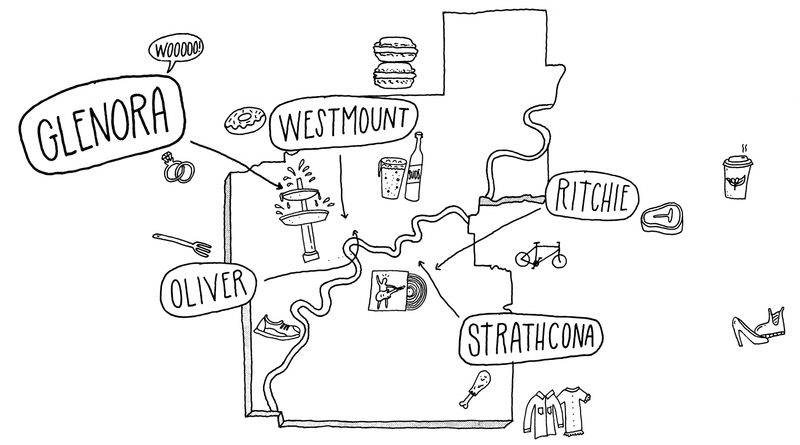 After five consecutive years on top, Strathcona has to surrender its crown to Glenora. The votes were close – we’re talking British Columbia elections close – but it was a win for Glenora nonetheless. (It’s also important to note that Russia did not interfere with the voting process.) Interestingly, Glenora’s win suggests a disparity in ideals and reality; the city is constantly promoting density, yet many of Glenora’s 3,513 residents vote against basement suites and infill housing. So while you won’t find diverse housing beyond large lots and detached character homes (1,155/1,569 homes in the area are detached, according to the 2016 municipal census), you will find the beautiful Alexander Circle with its iconic fountain, tree-lined streets, dream homes, an active community league and proximity to downtown, the river valley and High Street – and those are all things to love. Green Glenora: The Glenora Community League building uses solar panels, thanks to a pilot project initiated by the Edmonton Federation of Community Leagues. While not No. 1 this year, locals still love Strathcona for its density and amenities including the weekly farmers’ market, walkability, patios, venues for theatre and live entertainment and annual festivals including the Edmonton International Fringe Theatre Festival – there’s plenty of appeal that draws locals from all neighbourhoods of the city. Green Strathcona: That bright green fixture in front of Next Act Pub next to the bike corral is actually a bike repair station. It includes a tire pump and eight tools for on-the-go repairs. The controversy over the new Brewery District didn’t hurt Oliver’s consistent placement in the top five, suggesting that the new development appeals to locals with its shopping, dining and, yes, parking. Green Oliver: Over on High Street, Carbon Environmental Boutique sells eco-friendly and sustainable lifestyle and home products in a space that’s equally green. Talk about getting better with age. Though almost a century old, the neighbourhood of Westmount continues to win over our readers with its refurbished historic homes in an established setting close to (but far enough from) the bustling 124th Street. Green Ritchie: Ritchie Market is a bike commuters dream: it’s got Velocity Cycle’s Creek Side shop, is close to the Mill Creek Ravine and has parking space for 50 bikes. There are over 40 public electric vehicle charging stations in Edmonton, including four in South Edmonton Common, one in City Hall Parkade, and two fast charging stations at Simons in Londonderry Mall. Simons in Londonderry Mall in Kilkenny uses solar panels to generate over 50 per cent of the store’s energy. Steam Whistle Brewing has installed bike repair stations outside of Next Act Pub in Old Strathcona, Kelly’s Pub downtown, Sherlock Holmes in Garneau and Duggan’s Boundary in Bonnie Doon. Craft Beer Market downtown is Leaders in Environmental Accountable Foodservice (LEAF)-certified, and practices sustainability by using green energy, biodegradable products and eco-friendly uniforms. Do you plan on using any incentives to make your home more environmentally friendly? This article appears in the August 2017 issue of Avenue Edmonton. Subscribe here.